In whisky, we are easily fooled by our eyes. A deep mahogany colour says ‘Sherry’ so loudly that we’ll probably taste it even if it’s not there. Refuse to use spirit caramel, however, and your whiskies might turn out pale – but no less interesting. Cara Laing, whisky director at Douglas Laing, looks on the lighter side. 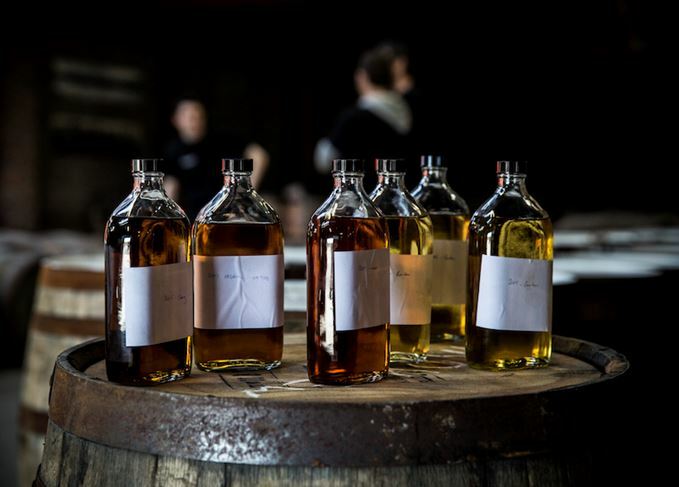 In January, I was at the annual National Whisky Festival in Glasgow and one thing really struck me: when it comes to whisky, there’s some serious colour prejudice out there. At the show we had a very pale Caol Ila single cask and our Scallywag 13-year-old, which people were fascinated by because it had such a dark, Coca-Cola-like colour. They immediately assumed it was going to be of a far superior quality to the pallid Caol Ila. This assumption of ‘the darker the better’ should be challenged because, in my experience, a pale colour certainly does not mean that a whisky is in any way insipid or lacking in taste or impact. At these shows, the level of knowledge is usually pretty good, and people understand terms like ‘non-chill filtration’ and ‘cask strength’. Our pale whiskies sometimes get positive comments like: ‘Ooh, this looks interesting,’ or others like: ‘This looks new, what is it? Is it a whisky or is it gin?’ I should stress that not all our whiskies are pale. We’ve also got plenty of very deep, dark amber crackers. At Douglas Laing I am very used to looking at whiskies that are often like white wine in colour. With all our whiskies, whether it be single cask expressions like Old Particular or our blended malts like Big Peat or Scallywag, our philosophy is never to add colour, never to chill-filter and always to leave at a high strength. In essence, it’s about leaving it as natural and untampered with as possible. In a previous life, working for some of the bigger boys in the industry, I got used to seeing their dark whiskies, and I fully understand why they add caramel colouring as it’s crucial for them that their whiskies always look consistent wherever they’re sold. Personally, I believe more in our approach of: don’t add anything or take anything away. I’ve tried some amazing whiskies that are exceptionally pale, and some of them are incredibly old. I think there’s definitely a misconception that ‘pale’ means ‘young’, ‘fiery’ and ‘lacking in quality’. Sometimes that is true, but very often it is not. Right now we’re in the thick of our monthly sample process, trying all the cask samples that are brought in. One was very young – a six-year-old Laphroaig that was incredibly pale, but probably the most memorable of the 25 samples, which included a 30 year-old Macallan and a Port Ellen. There was something so flavoursome about the Laphroaig, which had no fiery, harsh, newmake youth about it. It was very refined and perfectly balanced. Despite the peaty impact, there was a real smooth, delicate character, yet it was one of the palest whiskies I’ve ever seen at Douglas Laing. They say ‘you buy with your eyes’, but with whisky consumers, particularly those who know and understand the spirit well, I would love them to open their eyes a bit wider and appreciate that it’s not all about the colour. And not to be totally misled by the way some of the bigger companies do add caramel colouring. Without mentioning names, I have seen well-known malts in their natural state from the cask and, when you compare them to the deeply coloured bottles of the same malts released by their owners, it really is night and day. As I say, I understand the principle of adding colour, I just think it’s often misleading. If a whisky has genuinely been aged in Sherry, then let that natural colour shine through, instead of shoving in a load of caramel colouring and undoing all those years of goodness. I have no doubt this colour prejudice is linked to people’s misunderstandings about age. There is definitely a connection with the deeper the colour, the older and therefore the better the whisky. When I worked for Suntory, it was drilled into us that 70% of whisky’s flavour comes from the wood, and that’s something I probably agree with. But it doesn’t mean a whisky is in any way inferior because it’s pale. Recently I tried a 40-year-old Cameronbridge. After 40 long years in oak, there was next to no colour, but the flavour was phenomenal – it was bursting with tropical fruits, candy, custard creams and deliciousness. But on looks it was barely a shade or two above water. For me it proved once again that colour is no indication of quality, and nor is it generally a great reflection of age. The Belgian whisky aficionado, Bob Minnekeer, has done tastings using the same whisky coloured with different food dyes, and it was fascinating to learn how people’s expectations of what they were about to taste changed according to colour. And that supports my view that it is very misleading to judge any food or drink by its looks. I think you just have to get in amongst it and give it the benefit of the doubt. Ultimately, it all comes down to education. As a small whisky company we rely on the big boys to lead the way on education, but I doubt any of them are necessarily going to want to open the caramel colouring can of worms, particularly in an era when consumers crave transparency and organic produce with nothing added. My father Fred told me when he was showing Big Peat at a whisky show when it launched years ago, a guy came up and said: ‘I’m not trying that. It’s ridiculous. Why have you got such a stupid face on the front?’ Dad said: ‘Ok, well if you don’t like that I’ve got something under the table I think you’ll really like,’ and proceeded to pour him a dram of Big Peat. ‘Och, that’s a great whisky!’ cried the man. So, my simple message is – whatever the dram, leave your colour prejudices to one side, close your eyes and simply trust your nose and tongue. It should all be about taste, not looks, for, as the old saying goes – don’t judge a book by its cover.